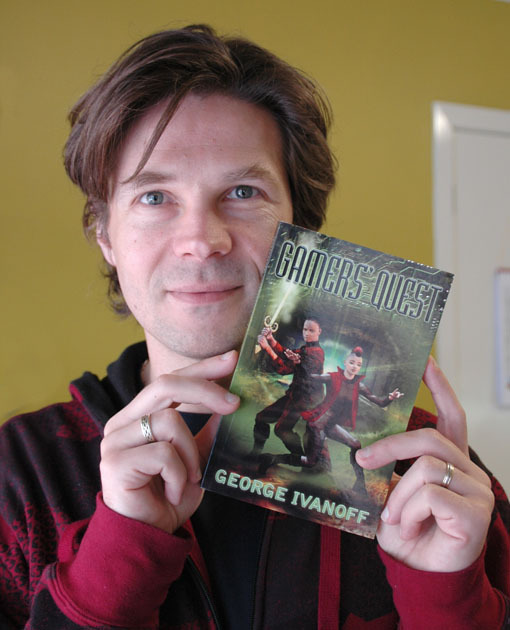 Today, I’m quizzing author, George Ivanoff about his writing career. George explains how he began working with Ford Street Publishing, and how he promotes his books. Ford Street Publishing don’t accept unsolicited manuscripts. How did you sign up with them? Gamers’ Quest had an unusual genesis. Ford Street Publishing is the brainchild of author, Paul Collins. I had written for Paul a couple of times in the past on education projects. Now that he had started up a trade publishing business, he remembered me and asked me to contribute to Trust Me!, a short story anthology. The story was called “Game Plan”. One day Paul mentioned to me that fellow author, Meredith Costain, had read the story and thought that it would make a good basis for a novel. Never one to let an opportunity slip by, I immediately said “So, if I write it, will you publish it?” Paul responded with a guarded, “Well, when you have an outline, send it to me and I’ll take a look.” I went away and had a think about it. The more I thought about it, the more excited I got about the story potential. So I wrote an outline, as well as the first few chapters. Two days after sending it to Paul, I had a contract. Do you have an agent? Would you consider using one? No I don’t have an agent. You don’t need one if writing for the education market as there is usually very little room to negotiate on contracts. But I would certainly consider using one in the future for trade publishing. How did you go about negotiating contracts with your publishers? As I said previously, there is usually very little room to negotiate education contracts. There’s a standard contract for all the authors on a series. Having said that, I have negotiated on a couple because I thought they were unfair. In most of those cases the publisher came to the party. But there were a couple of cases where I didn’t take the contract because they wouldn’t negotiate. With Gamers’ Quest there was no need to negotiate because I was happy with the contract they offered me. For your latest book, what aspects of publicity and promotion will Ford Street handle? What do you plan to do? Ford Street have produced posters, bookmarks and stickers which they have been sending out all over the place. They organised a book launch. They have also set up some interviews and guest blogs for me. And they’ve sent out over 80 review copies of the book. For my part, I’ve been blogging, doing interviews, school visits and book signings. I also put together the Gamers’ Quest website and had the book trailer made. Why did you decide to do a book launch? Well, I wanted one because I thought it would be FUN… and it was. But the decision was my publisher’s. It’s a way to announce the book to the world, to sell a few copies and generally kick off the promotion. Tell me about your book signings. Signings are a difficult thing. You just never know how many people will show up on the day. It could be 50. It could be 5. I’ve been to signings where well-known authors have had no more than a dozen or so people. I promote them with FaceBook, Twitter (Follow me on Twitter! Go on, you know you want to), blogs, etc. I send out info to the local schools and libraries. Then I sit back and cross my fingers. By the way, I’ve got a signing coming up this Saturday (8 May) at Angus & Robertson Ringwood (Eastland Shopping Centre) in Victoria at 11.30am-12.30pm. Come along and say “Hello!”. Have you promoted your book on radio? Tomorrow, George goes into detail about his online strategy for promoting Gamers’ Quest.